This EP, a companion to the band's excellent 2014 full-length record, suggests that lower-fi recordings and ambitious ones are not mutually exclusive. 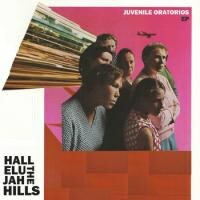 Juvenile Oratorios arrives as a companion piece to Hallelujah the Hills' 2014 masterstroke, Have You Ever Done Something Evil?. This EP comes as part of a new vinyl edition of that album, but it doesn't exactly continue the sonic world of Have You Ever Done Something Evil?. Instead, this EP feels like a scrappy satellite orbiting that planetary album, with all its huge peaks and valleys. These songs hiss and rattle, words get obscured by fuzz. But through the pared back fidelity, you can hear the lean rock rundown of "Compulsory Champagne" churn with muscled power. "Devil Level Zero" is big and expansive, first scraped out by echoes and then piled up with tangled guitars, baying vocals, and crashing drums. "Bouquet of Omens" is the catchiest of the bunch, a propulsive tune that slows to a shadowy crawl when Ryan Walsh announces there's "no more wires in the bloodstream," another in a long line of memorable lyrics from the Hallelujah the Hills catalog. "Kick in the Feels" meshes all these elements, the sweet glide of the leanest parts here with the careful swell of "Devil Level Zero", and marks a fitting end. Leave it to Hallelujah the Hills to craft a four-song EP that feels this grand. Despite the shift in fidelity, this suggests that lo-fi recordings and ambitious ones are not mutually exclusive, and that sometimes rough recordings can sound mighty smooth.